In recent years there has been growing awareness that a major reason for the worsening global environment is the failure to create adequate institutional responses to fully address the scope, magnitude and complexity of environmental problems. Much of the criticism directed at the global institutions has focused on the necessity for greater coordination and synergism among environmental institutions, policies and legal instruments, and the need for approaches that take better account of the inter-relationships between ecological and societal systems. This book seeks to fill the gap in knowledge and policy-making that exists, particularly in international law. 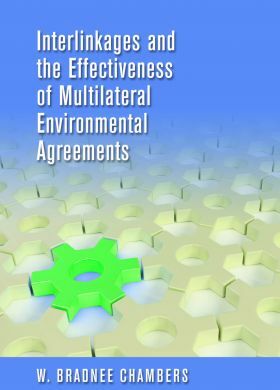 In the course of doing so, it examines the essence of the assumptions made about interlinkages and multilateral environmental agreements (MEAs), provides a framework for measuring the effectiveness of MEAs and shows how the effectiveness of MEAs can be improved by interlinkages. Moreover, it demonstrates how MEAs that cooperate with treaties outside the environment in other sectors of sustainable development can improve their effectiveness. W. Bradnee Chambers is the Senior Programme Officer at the United Nations University Institute of Advanced Studies (UNU-IAS) in Yokohama, Japan.